A presentation overviewing ATK’s preliminary proposal for the upcoming advanced booster competition for Space Launch System (SLS) claims the new motor will be 40 percent cheaper and 23.5 percent more reliable than the five segment booster that will initially launch with the Heavy Lift Launch Vehicle (HLV) – all while adding 15.1mT of additional performance. With a 30 year history in providing the boosters for the Space Shuttle Program (SSP), ATK’s solid motors boast a huge knowledge base. As seen in Flight Readiness Review (FRR) and post mission In Flight Anomaly Review (IFA) documentation, the four segment boosters – like the rest of the “Shuttle Stack” – ended their career in style, with the aforementioned documentation providing an impressive report card on their performance and lack of issues. It was also notable that ATK continued to refine and tweak the motors during the final flights, with one example being the redesign to the SRB Thrust Vector Control (TVC) Auxiliary Power Unit (APU) fuel pump for the final three Shuttle missions, removing a “critical 1” failure scenario that held the small potential of a LOV/C (Loss of Vehicle/Crew) event. While the boosters are continuing to evolve, the huge legacy of their role with the Space Shuttle will directly feed into their use on the SLS – a Shuttle Derived (SD) Heavy Lift Launch Vehicle (HLV). The SLS will debut at the end of 2017 as the Block 1 configuration consisting of a core stage using four Pratt and Whitney Rocketdyne (PWD) RS-25Ds – formerly used by the Shuttle Program – two ATK five segment Solid Rocket Boosters (SRBs) and an Interim Cryogenic Propulsion Stage (ICPS), highly likely to be a Delta Cryogenic Second Stage (DCSS). Three static fire tests have already taken place on the five segment boosters, as the motor transferred its service from the now-defunct Ares 1’s first stage to SLS. 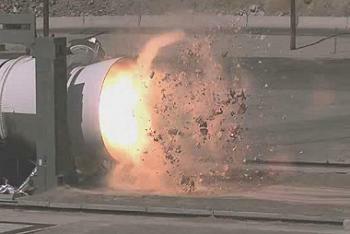 The latest test – DM-3 – took place in 2011 and was the last in a series of development motors to be tested. It was also the most heavily instrumented solid rocket motor in NASA history, with a total of 37 test objectives measured through more than 970 instruments. (Image taken from the amazing 220mb super slow-mo DM-3 Five Seg Motor Ground Test Video – available in L2 – LINK). The previous test – DM-2 in 2010 – was carried out with a total of 53 design objectives, measured through more than 760 instruments. For that test, the motor was cooled to 40 degrees F – a “cold motor” test – in order to measure solid rocket motor performance at low temperature, as well as to verify design requirements of new materials in the motor joints. ATK are already deep into preparations for the first qualification firing of the five segment booster, with QM-1 set to take place in May, 2013. It is expected that the five segment solid motor will be used on all SLS flights until at least the middle of the 2020s, with source information noting SLS managers have the option to launch up to 10 missions using the current five segment booster design. The forward path for SLS is to evolve from the 70mT HLV into the 105mt – known as the Block IA – before eventually advancing into the 130mT Super Heavy launcher known as the Block II. As part of enabling this evolution, a competition will decide between numerous proposals that will create an “advanced booster” option for SLS, which will be implemented on the Block 1A (or Block 1B – depending on the configuration), prior to its role with the Block II from its first launch. 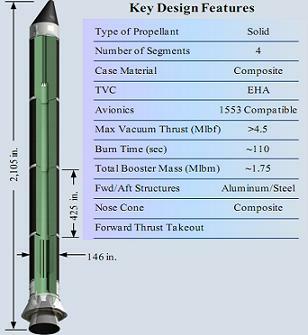 One such proposal – which is currently being worked on under NASA’s SLS Advanced Booster Engineering Demonstration and/or Risk Reduction (ABEDRR) procurement – was reported on by this site after Dynetics, Inc. and Pratt & Whitney Rocketdyne (PWR) formed a team “to offer an affordable booster approach that meets the evolved capabilities of the SLS” – and presented their overview at the 63rd International Astronautical Congress, Naples, Italy in October, 2012. ATK’s proposal – outlined in a presentation acquired by L2 – builds on their legacy, with a motor that is “advanced” on several levels, by “provid(ing) NASA the capability for the SLS to achieve 130 mT payload with significant margin, utilizing a booster that is 40 percent less expensive and 24 percent more reliable than the current SLS booster. 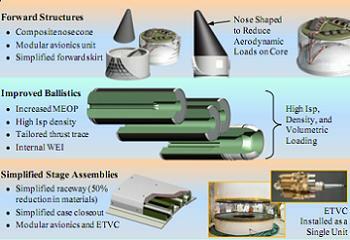 ATK cite advanced manufacturing techniques and streamlined processes – combined with an innovative design that includes the nose cone reshaped to reduce aerodynamic loads on the core stage – as a major part of the 40 percent reduction in costs when compared to the five-segment SRBs. The advanced booster will utilize composite casing with low cost, high strength fibers – represented as black casings in notional graphics. ATK are also proposing to reduce the number of segments – back to four – to improve processing at launch site, along with simplified forward and aft structures and increased comparability with the overall vehicle avionics architecture. Charts provided in the presentation expand on areas where performance will be improved, all while reducing costs when compared to the five segment motor. This can be clearly seen in examples such as the use of the composite casings, which provide a 4,128lbm payload capability improvement. The simplified stage assemblies comparison cites the saving of 480 man hours – a 50 percent reduction in the man hours required on the five segment motor. 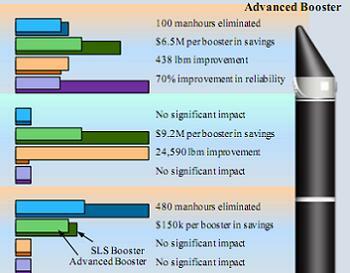 Most impressive is the improved ballistics, with the higher ISP density of the propellent boosting payload performance by nearly 25,000lbm, yet saving $9.2m in costs per booster. As listed, the increased operating pressure, improved propellant, tailored thrust profile, increased expansion ratio all combine to provide a 15.1mT boost to the SLS’ payload capability. However, what can’t be estimated is ATK’s foothold as the provider of boosters for NASA’s human space flight program for the past 30 years. A continuation with the familiarity of the solid motors is continually classed as the favored option by SLS sources.